Bhutan is a nation that measures success in Gross National Happiness. Here, Buddhist way of life of meets modernity. Tucked away in the Himalayas, Bhutan has been shrouded in mystery and folklore for a long time. When we were planning our trip to Bhutan, I had no idea that Bhutan was going to leave an indelible mark on my mind. Indians travelling to Bhutan do not need Visa. An identity document, either passport or an election commission I. D card is, however required for presentation at the immigration during entry, to obtain an entry permit along with 2 passport size photographs. Entry into Bhutan can be made either by land or by air. Our taxi, which was sent by the travel agent in Jaigaon, was waiting at the Bagdogra airport when we reached and it was a scenic four hour drive to Jaigaon. Jaigaon is a town in the Alipurduar district, West Bengal. It is located on India’s border with Bhutan. The main overland entrance to Bhutan is through Jaigaon and Bhutan Gate separates the two countries. He then tdrove us to the Bhutan side, to Hotel Shelgaon, where we slept for the night. Next day morning we got ready by 9 am and went with the travel agent and the taxi driver. 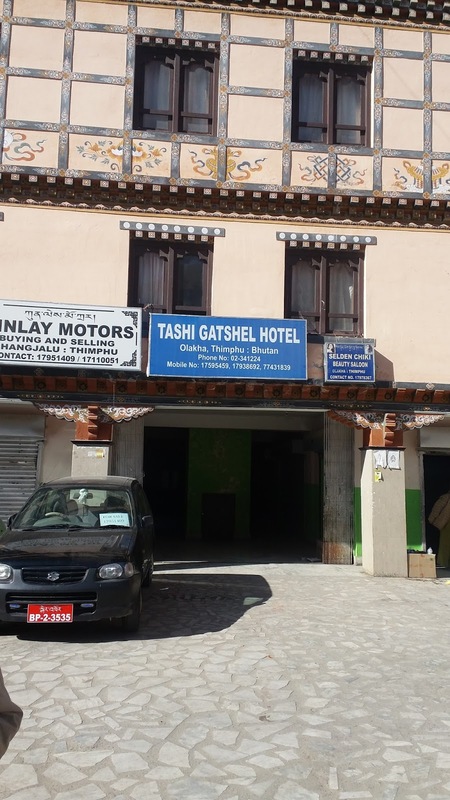 The entry permit was to be obtained from the office in Phuentsholing . Separate permits are required for the visitors and the driver. It was a Tuesday and we managed to get the permit by 12 o’clock. On Mondays usually crowd will be much more and another visitor who got the permit on Monday told that he had to wait from 9 am to 1 pm. We started our four hour drive to Thimpu, stopping on the way for lunch. The lunch was just divine! It was momos, noodle thukpa, rice, dal and mushroom sabzi. Momos were so good that on every day we were having them, sometimes even twice a day. When we saw the dal first time, we thought, what a watery dal! And it was just plain dal, not dal fry. But once we tasted it, we got hooked. It was impossible to fathom how such a watery dal can be so delicious. Must be because they do organic farming there. Even the rice is so delicious that it can be eaten just like that. In restaurants we saw the locals eating just the rice and leaving the whole bowl of dal and part of the vegetable that was served. We don’t believe in wasting food, so it was painful to see so much of food wastage there. It is impossible to believe that on all the six days in Bhutan it was rice, dal and a vegetable dish for lunch and dinner, and every meal we were looking forward to eat. The wait can be too long. After the four hour drive we reached Thimpu. It is the capital and largest city of the Kingdom of Bhutan. The ancient capital city of Punakha was replaced by Thimphu when it was established as capital in 1955, and in 1961 Thimphu was declared as the capital of the Kingdom of Bhutan by His Majesty the 3rd Druk Gyalpo Jigme Dorji Wangchuck. 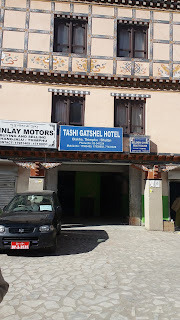 In Thimpu we checked into hotel Tashi Gotshal. We ordered the food and had to wait for one and a half hours for the dinner to arrive at the table. But the food was awesome, just rice, roti, dal, bitter gourd sabzi and egg curry. After that we made it a point to give food orders in advance. Breakfast and lunch order on the previous night and dinner order in the morning. Because, literally, they buy the vegetables to be cooked after you order!! On the next day after the breakfast of aloo parathas (we got on time since it was ordered the previous night) we started our sightseeing tour. First we visited the National Memorial Chorten, which is a monument to the Third Druk Gyalpo and to World Peace. One can see elderly Bhutanese people circumambulating the Chorten throughout the day. Chorten literally means ‘Seat of Faith’ and Buddhists often call such monuments, the ‘Mind of Buddha’. It has intricate sculptures and gorgeous painting and is an extraordinary example of Buddhist architecture and artwork. Our next stop had something very unique. Takin is the national animal of Bhutan. The Takin Preserve, located in the Motithang district of Thimphu, is a wildlife reserve area for the Takin, which is native to Bhutan, India, and China. They are docile creatures whose unique appearance attract special attention. Local legends attribute the creation of these animals in Bhutan by a 15th century saint named Drukpa Kunley, popularly known as the Divine Madman. Drukpa Kunley, who was not only a religious preacher but also a proficient tantric, was requested by the people of Bhutan during one of his religious lectures to conjure a miracle before them. The saint agreed to do so provided he was fed for lunch, a whole cow and a whole goat. Once served, he devoured the food of both animals and left out the bones. He then took out the head of the goat and fixed it to the skeleton of the cow and uttered abracadabra and the magic worked. With a snap, he created a live animal, which had the head of the goat and the body of the cow.The animal sprang up and moved on to the meadows to graze. The animal was then given the name dong gyem tsey (takin). Since then this animal has been a common sight in the hills of Bhutan. Because of this magical creation with high religious connotation, the animal has been adopted as the national animal of Bhutan. Changangkha Lhakhang is an old fortress like temple and monastic school perched on a ridge above Thimphu. It was established in the 12th century on a site chosen by Lama Phajo Drukgom Shigpo, who came from Ralung in Tibet. The central statue is Chenresig in an 11-headed, thousand-armed manifestation. There are enormous prayer wheels to spin and even the prayer books in the temple are larger in size than usual Tibetan texts. It has a beautiful courtyard. The Royal Textile Academy of Bhutan was established in 2001. It was set up to promote Bhutan's textile arts and to serve the interests of the weavers in order to preserve traditional textile patterns. Weaving is an integral component of the culture and tradition of Bhutan. With the aim to preserve and promote this living art, the Royal Textile Academy of Bhutan was instituted in May 2005 under the patronage of Her Majesty Gyalyum (Queen Mother) Sangay Choden Wangchuck as a non-government, non-profit organization. The RTA operates a state of art museum to display its collection of artefacts to further the understanding of Bhutan’s rich textile traditions and way of life. The Museum consist of two galleries: The upper gallery which has a permanent display of the various types of textile weaves in the country and the lower gallery that showcases temporary exhibitions on special themes. These temporary exhibitions usually run for nine months. While watching the nuns pray and chant mantras in a narrow space in front of a small shrine in the Zilukha nunnery, I had the spontaneous recall of a similar life when I spent the whole life doing the same and died without experiencing any peace. Suddenly I was engulfed by a wave of depression, which left me on coming out and watching the beautiful nature outside. We got a great view of Tashichho dzong (a Buddhist monastery and fortress on the northern edge of Thimpu) from this monastery. Known as "fortress of the glorious religion", Tashichho Dzong, or popularly known as Thimphu Dzong, is an impressive structure that houses the Bhutanese government and stand on the right side of the Wangchu River. It houses the secretariat, throne room, and offices of King of Bhutan. The northern portion is the summer residence of the Je Khenpo and the Central Monastic Body. Great Buddha Dordenma is a gigantic Shakyamuni Buddha statue in the mountains of Bhutan celebrating the 60th anniversary of fourth king Jigme Singye Wangchuck. Its Construction began in 2006 and was planned to finish in October 2010, however construction did not conclude until 25 September 2015. The completed work is one of the largest Buddha rupas in the world, at 169 feet (52 m) and contains 100,000 8-inch-tall and 25,000 12-inch-tall gilded bronze Buddhas. When we started our sightseeing tour we realised that our driver was coming for the first time to Bhutan. He had lied to the travel agent who hired him that he knows Bhutan. It was God’s grace that my husband had chartered out the whole itinerary and had downloaded the google map. So he was guiding the driver throughout. And during the visits, he would run before us to explore, take selfies in different poses, and even ask us to shoot his photos! In Thimpu, we had to obtain permit to visit Punakha on the next day. The driver’s permit had to be obtained from another office and since the driver didn’t know the location, we were driving around for an hour to locate the office! When we reached our hotel, our dinner was ready at 7pm since the order was given in the morning itself. Steaming red rice, rotis, dal and mixed vegetable sabzi were waiting for us.